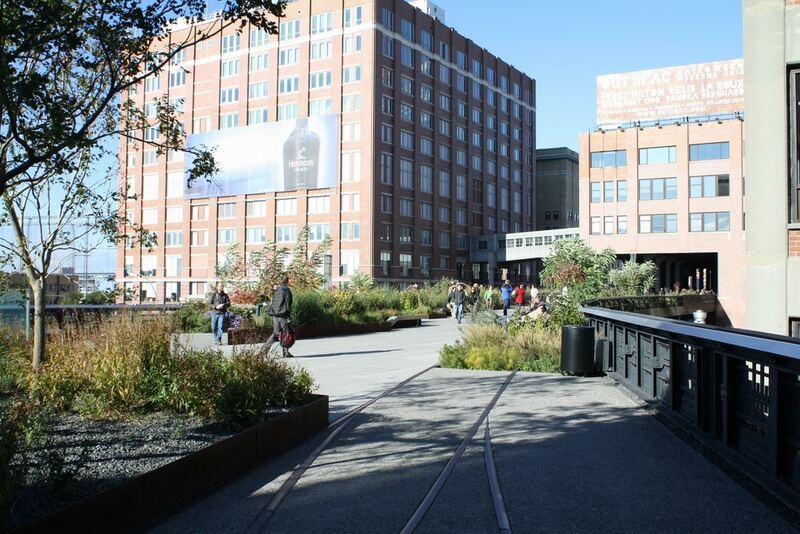 New York City’s High Line Park is situated on a former elevated freight railroad that was in operation from 1934 until 1980, on the west side of Manhattan. I’d been wanting to visit this distinctive park since it opened in 2009, and finally had the opportunity to do so this October. 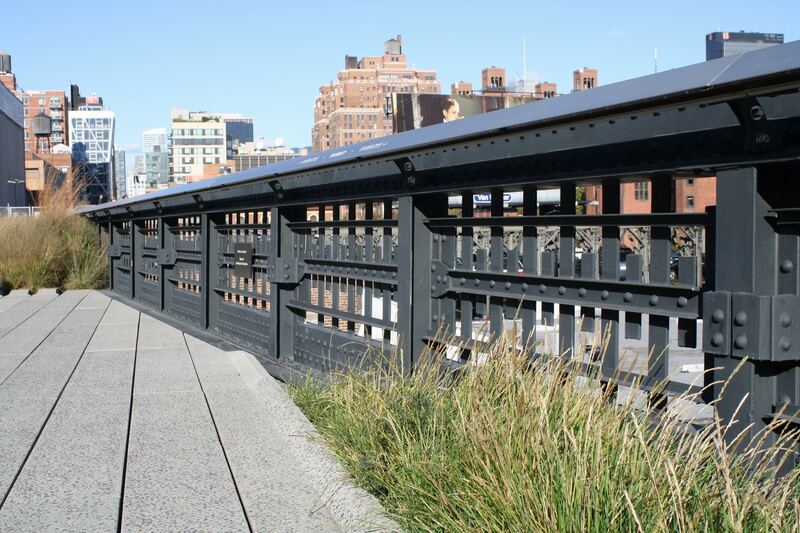 The next phase of the High Line is scheduled to open in 2011. 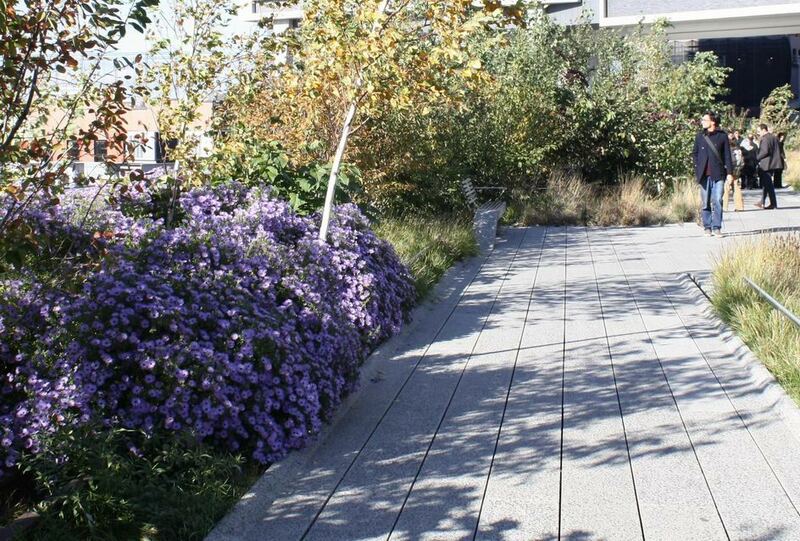 The High Line Park was designed by the landscape architecture firm of James Corner Field Operations. Although it is a linear park, it’s not one whose purpose is to get from Point A to Point B. Its walking surface isn’t laid out in a direct line; it instead shifts left and right, and is punctuated with islands of plantings and a diversity of areas for viewing and sitting. The design compels you to slow down and invites you to linger. 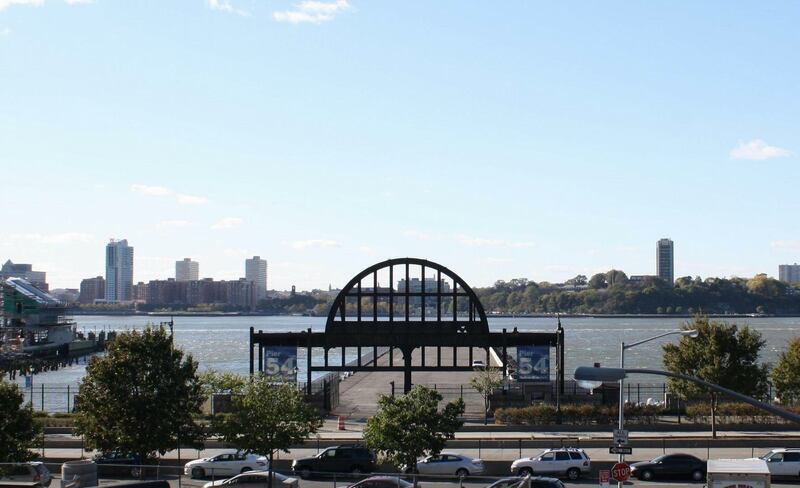 From this park which is 30 feet above street level, you can take in views of the Hudson River and the variety of buildings and streetscapes of the up-and-coming Meatpacking District. 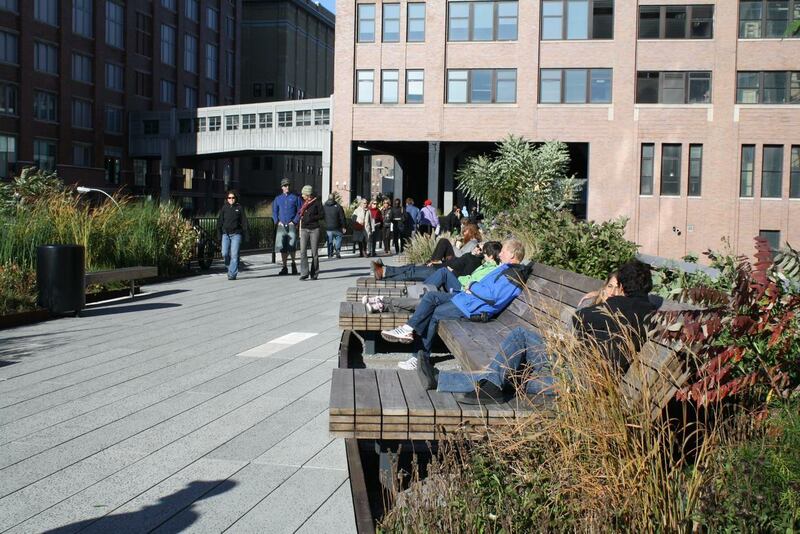 You can also just enjoy the immediate surroundings of the uniquely-designed High Line itself. 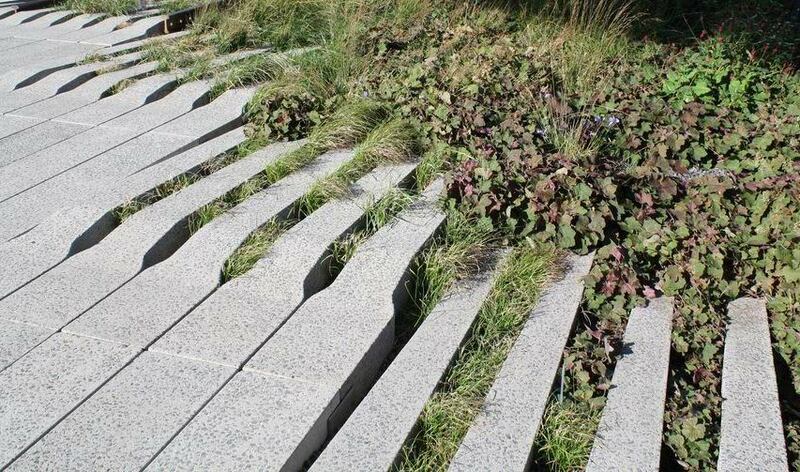 The design of this park echoes the history of the High Line in several respects. Train tracks cut through the planters and walkways. Historic Art Deco railings have been retained and renovated along some of the park’s edges. In addition, the choice of plantings reflects the self-seeded landscape that dominated the rail line after trains ceased using it. 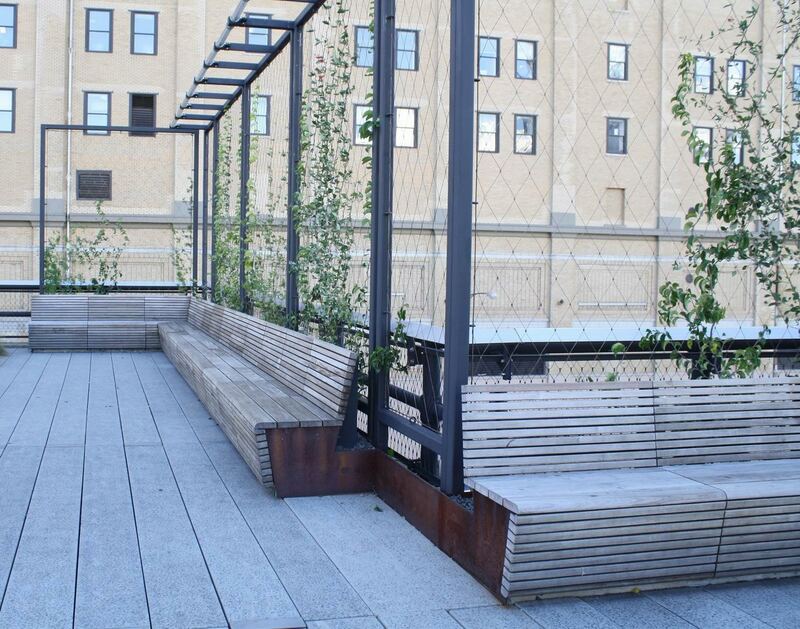 Other interesting features include custom linear concrete pavers that separate and narrow as they blend into plant beds; benches that appear to lift up from the walkways; and an area with amphitheater-type seating oriented toward a street view. Buildings also straddle the park in three locations. 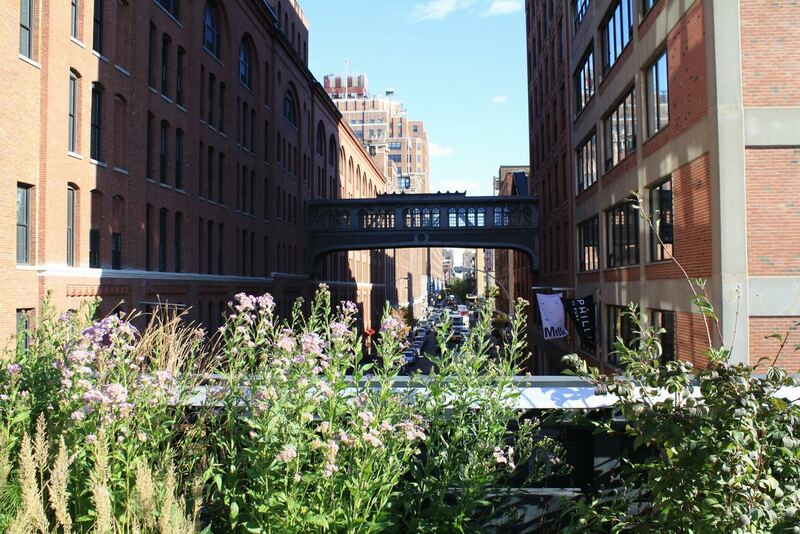 I would like to return to the High Line during other seasons, to observe the wide variety of plants when they’re in bloom, and to do some more photography. I’m also looking forward to visiting the second phase. Walking this park is truly a delightful and unique experience, which is definitely worth repeating! 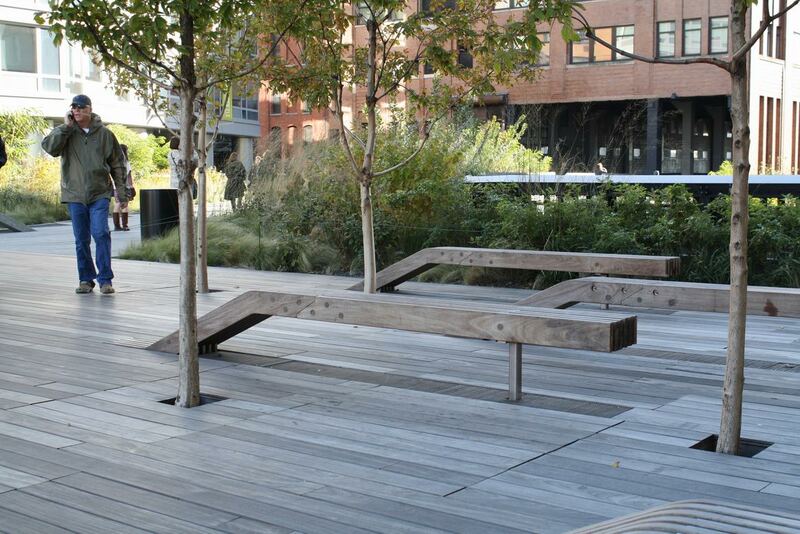 Benches appear to emerge from the deck. It was too chilly on the day of my visit to sit in this shady area. Additional information about the High Line can be found at http://www.thehighline.org/. Thanks for sharing these photos – I have been wanting to visit this park too, I love visiting places where urban blight is turned into useable spaces full of life. Looks cold in the pics, but even so, if I lived around there I’d much rather walk through this on my way home than have to deal with street-level noise and commotion. The asters are gorgeous! great proyect and post!!! I hope we´ll have something like this in Spain soon. I love how they retained the rails and bridges in some locations, blending old and new goes a long way towards creating one-of-a-kind spaces for this one-of-a-kind city! The main railline in Worcester use to run where City Hall now stands. It would be fun to install rails in the streets and sidewalks abutting the building where the tracks use to lay to make this connection – it’s the railroads that built this city and continue to power it today….